With the arrival of autumn comes the arrival of one of my favorite foods in the world – apples! Now, I’m not going to talk about Johnny Appleseed and how he really went around and planted nurseries of apple trees, not just seeds; or how the first apples were exported in 1768 to Ben Franklin in London. Nor is this a post about how apples are a member of the rose family, are fat, sodium and cholesterol free, and float because 25 percent of their volume is air – although I guess I just covered all that above. Over the past few weeks, we have gone apple crazy in our house! It all started with my hubby taking the boys apple picking as a surprise one day and coming home with a bushel of apples. Let the creativity begin! We all love chips. But we all hate the grease and the fat and the general ick feeling we get after eating them. Want a guilt and grease free snack? 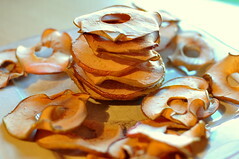 How about apple chips! They’re super easy! First, core your apples (you’ll need about 2 large for one tray, 4 if you’re doing two). I have a handy-dandy corer from Pampered Chef, but any store with a kitchen department will have one! Next, slice VERY THINLY. If you have a thin serrated edge knife, that will get the best results. You want them about 1/8 inch thick. Preheat your oven to 200 degrees F. Line a sheet with parchment paper. Place a single layer of apple slices on the parchment paper. Spray lightly with canola oil spray, sprinkle with a mixture of cinnamon and brown sugar. Bake for 2-3 hours (1 sheet, 3-4 hours for two sheets stacked on different levels) leaving the oven door open a crack to let any moisture escape. This timing really varies, just check after 2 1/2 hours. You want them nice and crisp, not soggy. Store in an airtight container – if you can resist from eating them that long! Slice up a few more apples, leaving everything as is (no coring or peeling), 1/8 inch thick. Bake at 200 degrees for 2 hours (1 tray). When the apples are done, string the wire onto a needle or nail, then arrange the apples in a large circle. Make sure to leave enough wire at the end to lay the apples flat. Knot and hook the ends. Flatten the apple circle onto the wreath and secure with hot glue. Add any extra apples to fill it out or embellishments you like and you have a fantastic fall wreath! If you’d like it to last for years to come, spray with some craft acrylic matte sealer spray. Heat about 1 cup of oil in a deep frying pan. Peel, core and chop apples into pieces. Pour in milk, eggs and oil and stir well until blended. Drop the batter by spoonfuls into the hot oil. Cook about 2 minutes per side, until they are lightly browned. Remove and place on paper towel to soak up excess oil. Sprinkle with cinnamon sugar or icing sugar. I remember my Oma and Opa coming over a few times with their food strainer and making applesauce at my mom’s house. It was a HUGE process! But I knew it was one I wanted to repeat. Only problem – no strainer. So I borrowed one from a friend, and I think we will be purchasing one ourselves (we also made tomato sauce – even with a hand crank it really cuts down on the prep time!). Never fear, if you do not have a strainer, I have a crock-pot recipe that also makes fantastic applesauce! Make sure your jars are clean and sterilized. The easiest way to do this is to run them in a CLEAN dishwasher on a sanitizer setting (about 20 minutes). Make sure you do this to time with your apples still being hot! Core and slice your apples (an apple corer slicer makes the process as lot faster! I leave the skins on for more flavour and a nice pink colour). Cook in a large pot with 1 inch of water until apples are softened. Follow strainer instructions to extract the sauce. Add sugar or cinnamon if you like (but I don’t). While still hot, pour sauce using a funnel (or make one out of the top of a pop bottle!) into the prepared jars. Screw on tops and lids and boil for 7 minutes in a hot water bath. OR if you have room in your freezer and want to skip this process, just let them cool down, then freeze the jars! For those who do not have access to a strainer, the process is the same, except you will core, peel and slice your apples (about 12 cups). Pull out your handy dandy crock pot, add about 1 cup of water and any sugar or cinnamon, then the apples. Cook on low for 6 hours or high for 3 hours, cool and enjoy! If you’re still game for some more great apple recipes, check out this Apple Crumble Pie (with lattice top option pastry instructions!) and Caramel Apple Cupcake recipes. Happy Autumn and happy apple picking! This is a seriously dangerous post. I could potentially gain numerous pounds if I make those apple fritters (which are quite possibly my favorite breakfast treat). I might have to risk it! What great ideas! 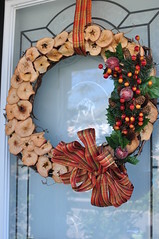 Definitely never thought to make a wreath out of dried apples. I’d be hard pressed to part with my apples though… 😉 But I love it! Might have to try the fritters! 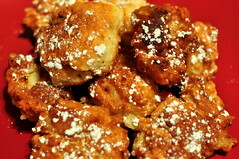 I am loving this, made apple fries yesterday without a recipe and they did not look that beautiful. I try your recipe next time. Love the apple chips idea, thanks!! !